Autumn is a perfect time for taking pictures. And when it comes to celebrations, it becomes twice as attractive for photographers, because there are so many things worth our attention – the joyful people, the traditions, and the beauty of nature. All this we can find in Halloween celebrations – a cocktail of inspiration for making creative photos! Halloween is not only about shooting pumpkins. But pumpkins are a great deal. 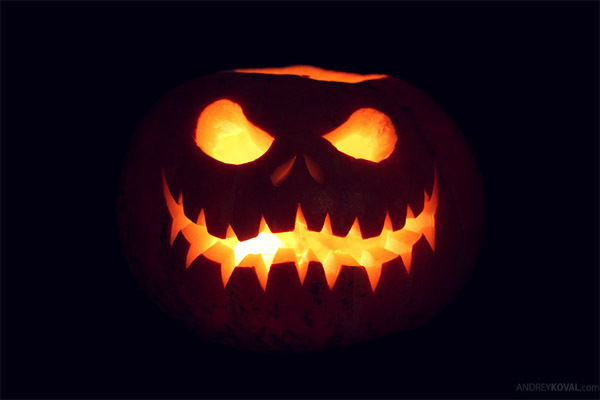 I’d say you definitely must photograph your jack-o’-lanterns, as you won’t keep them forever after the holiday, and you will definitely want to show your creations on the social networks. This is where you can also reveal your photo genius. Pay attention to the inside/outside light intensity of the lantern. You might want to shoot a mere silhouette of the carving – in this case you just need to set a candle inside, and bring the surrounding light to possible minimum. But you might also want to make the outer texture visible. 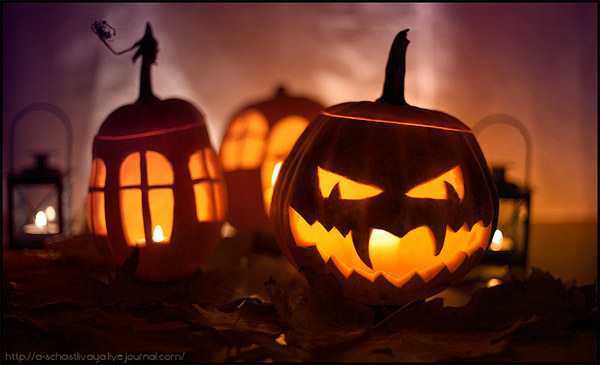 This can be more tricky – but you can try experimenting with candles inside and around the pumpkin, trying different exposures and balances. You will most likely need a tripod here, as the exposure times will be long. 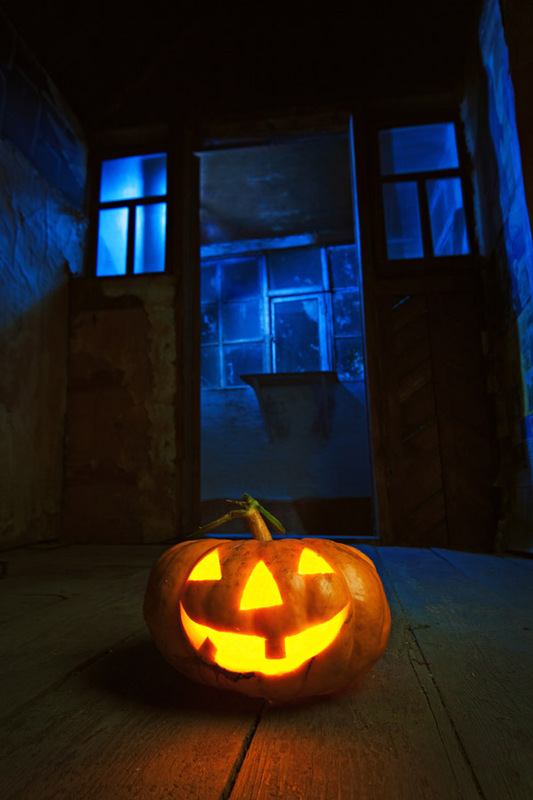 If you are lucky owner of a couple of Speedlites with a remote flash trigger, you can put one flash into the pumpkin, and point the other one at the ceiling. 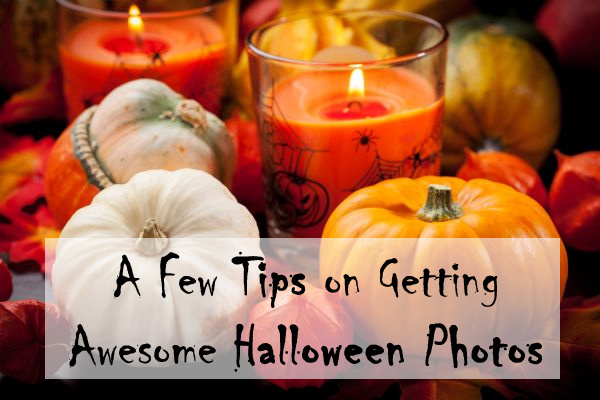 Or try mixed lighting – a candle in a pumpkin and a flash for outer lighting. This may require some more profound skills, but can give an astonishing effect due to difference in color temperatures – and will give you a really vibrant picture of cool and warm colors mix. The trick is, brightness of the candlelight will be adjusted with the shutter speed, while the intensity of the flash light must be adjusted by the flash power control. Just keep in mind, that no matter if the shutter speed is 1 second or 1/100 of a second, it won’t affect the intensity of the flash, but will affect the intensity of the candlelight. Aperture setting will affect both. 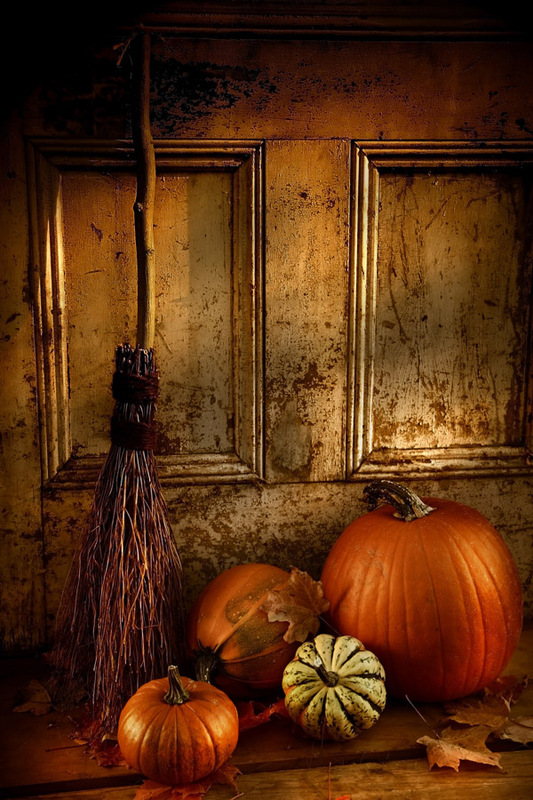 It always looks great when the main subject – a pumpkin – is accompanied by appropriate stuff like autumn leaves, wicker baskets, apples, mushrooms or maybe some scary stuff like rubber spiders or whatever you may find. Artificial spider silk would look absolutely awesome in such photos. Look for interesting surfaces, backgrounds, or even bring the pumpkin outside to make a couple of shots on the natural background of fallen leaves and gloomy crooked trees. You can also “decorate” the background with bokeh splashes of light, you can check out some hints on stellar bokeh photography for this. They can be scary, they can be funny – or they can be both at the same time. You can try everything possible – from low-key gloomy portraits of your friends to street photos of strangers. Just make sure it is a costumed man, not a real zombie. At least don’t come too close and use a telephoto lens if it turns out to be the latter. 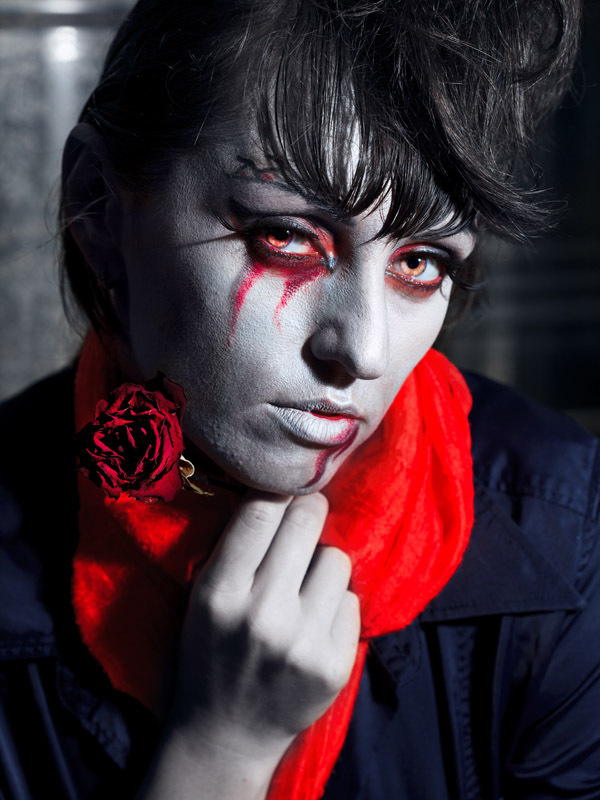 You might want to use only one light source, and don’t be afraid of camera shake when it’s too dark – make it a “special horror effect”. Actually this is where you can say goodbye to photography rules. Blur the images, light the subject from down below to get some scary shadows, use weird perspectives. Be a goth, be a punk, be a rebel! And by the way, who told that nice-looking people are not scary? So would you actually take advantage of the situation and shoot something on Halloween?